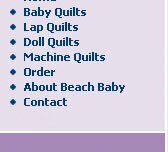 Beach Baby Quilts is now offering baby quilts and lap quilts that are machine-quilted as well as our usual "hand-tied" quilts. Quilting is the stitching that holds the three layers of a "quilt sandwich" together, while forming a decorative design. Machine quilting produces evenly spaced and sized stitches, and can be done a lot faster than hand quilting. This is the reason we can offer quilted products at reasonable prices. We've gotten the best results using a thin, lightweight cotton batting between the quilt top and the backing. We use what is called a "fill" style of quilting, which ignores the seam lines of the quilt. For some quilts, we use an "all over" design, such as waves, flowers or clamshells. For others, a "meandering" design is more appropriate. This quilting does not follow a design but is done "free hand," in random curved lines and swirls. Our tied quilts are made with a series of knots, hand-stitched and hand-tied at regular intervals over the quilt, or stitched and tied according to the geometric shapes of the patchwork pieces. This method works best with thick quilts because it is difficult to make quilting stitches through thick layers. Unless "machine quilting" is indicated, all of our quilts are tied and have the thick batting. Thank you for browsing through our lap quilts. These quilts are perfect for wrapping up on the living room couch, or for sitting on the porch on a cool evening. When you see one that interests you, please click on its thumbnail for larger photos, more information and to order.